Creamy and cheesy, this homemade macaroni and cheese is pure comfort food! Yield: 7 to 8 servings. Bring large pot of water to a boil. Generously salt. Cook the pasta until al dente, adding broccoli to pasta water after the pasta has cooked for 5 minutes. Drain. Meanwhile, add 3 tbsp. 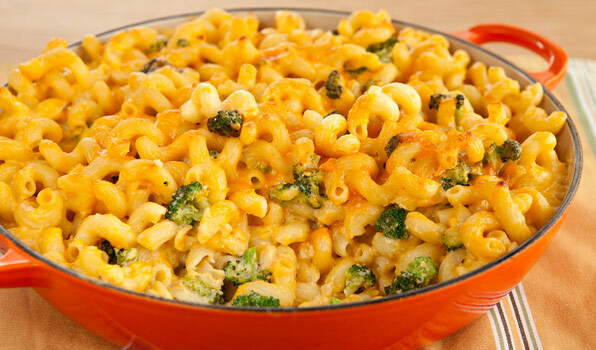 butter to an extra large, oven-proof skillet or low Dutch oven over medium heat. When butter melts, add onion and garlic. Cook until onions begin to soften, about 3 to 5 minutes. Add flour and stir to combine to make a roux. Continue to cook and stir the roux, about 2 to 3 minutes. Gradually whisk in milk, making sure to incorporate the roux into the milk. Continue to whisk mixture and bring to a boil. Reduce heat and simmer, whisking frequently, until sauce thickens, about 5 minutes. Season the sauce with salt and pepper, nutmeg and dry mustard powder. Bake until bubbling and top golden brown, about 20 minutes.